It’s been raining A LOT in California. How much, you ask? In the last month the Golden State’s been hit with not just one but two “atmospheric river” events. There’s been swell, sure, but with the threat of hypodermic needles the question remains: when’s the best time to get back in the water. First and foremost, the Surfrider study found a significant correlation between water quality and illness rates during wet weather. This isn’t surprising by any means, but now there’s data to back it up. 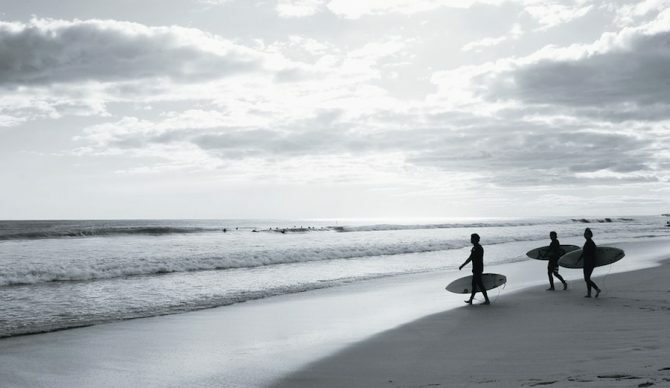 We’ve all heard, “County officials advise against ocean water contact for up to 72 hours after a rain.” According to the study, “Illness rates were highest when surfing during rain and the first day after the rain. Illness rates decreased with each day following rain, declining to near baseline levels after 3 days.” In other words, waiting three days is a good rule of thumb. Surfers in California typically understand that you take your life in your hands surfing after it rains. It’s worth noting that Surfrider’s study tested water exclusively in San Diego County. But, according to Rick Wilson, a senior staff scientist at Surfrider, elevated bacteria levels impact more than just Southern California (even areas that receive way more rain). I asked him, for instance, why people seemed (to me at least) to be less concerned about surfing after a rain or snow in New York. “I’m not sure why (or if) the problem should be less severe in NY,” he said. “I would think it would be bad wherever there was a large urban area with a high percentage of impervious surface. In fact, if anything, I would think NY would be worse than LA/OC/SD because we have separate storm drain and sanitary sewer systems in SoCal and NY has a combined sewer system.” Wilson mentioned that barrier islands on the East Coast could essentially shield surfers from the worst water. But, the point is surfers everywhere should be mindful of the potential risks. Ok, so if you surf after a rain you’re probably gonna get sick. But if it’s firing and nobody’s out at your local, you may find yourself weighing the options. A cold, you might say, is worth it for hours of head high pits to yourself. In San Diego, Surfrider found that, “Norovirus was detected in 96% of samples from San Diego River and 72% from Tourmaline Creek during a rain event.” According to the CDC, “Norovirus causes your stomach or intestines or both to get inflamed. This leads you to have stomach pain, nausea, and diarrhea and to throw up.” There is no specific treatment for Norovirus. In addition to gastro-intestinal illnesses, Surfrider also found an increased frequency of rashes, infected cuts, and a variety of other infections during wet weather. Obviously, the difference between detecting Norovirus in 96% and 72% of samples (see above) is significant. It goes to show that even between two areas that are within a few miles of each other, where you choose to paddle out is important. Surfrider found that bacteria levels decreased the further away from both the San Diego River and Tourmaline Creek that samples were taken.